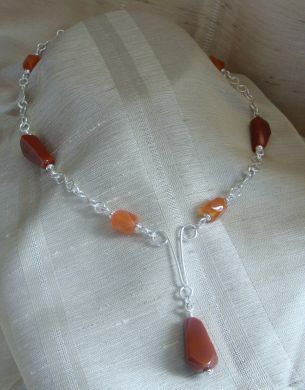 The Aries symbol is highlighted by red agates of two tones in this necklace made with both silver-plated and silver-filled components. The length of this necklace is approximately 39 cms (~15.35 inches), plus 6 cms (~2.36 inches) added by the pendant-like Aries symbol and central agate. Aries is the first astrological sign in the Zodiac and red agate is one of Aries gemstones. If your Sun sign or your Rising sign is Aries, you may feel attracted by red agate and you will certainly benefit from its energy (this can also happen if you have various planetary points in Aries or a dominant planet in that sign). Red agate is said to keep a balanced level of energy/action, so people can feel motivated to take action, but in a controlled way. Therefore, red agate can help people with a strong Aries influence to maintain their assertiveness, while regulating their impulsiveness. Ancient civilizations regarded Agate as a stone that prevented falls and stumbling, which is a good help for rush-prone Aries!